Invictus (who legally changed his name from Austin Mitchell Gillespie) appears to have been appointed, or to be in the process of being appointed, to the position of associate delegate by Anthony Macias, a current California Republican Party delegate for Santa Clara County. On February 23, Macias posted a photo on Facebook of a badge from the party’s Spring 2019 organizing convention bearing his name, the California Republican Party logo and the word “DELEGATE” in big, block letters. The Santa Clara County Republican Party did not return Right Wing Watch’s request for contact via phone. The site “Fakertarians” first alerted us to Macias’ Facebook posts in which he claimed that he had sent documents to the state GOP to appoint Invictus to an associate delegate position. The California Republican Party forwarded Right Wing Watch’s call to a voicemail inbox and our call was not returned. Macias claims to be pursuing a spot on the California Republican Party Platform Committee. If successful in this pursuit, Invictus, as his associate delegate, would become his alternate—meaning that Invictus would be able to substitute for Macias when votes are called. Positions on platform committees are coveted by right-wing activists, who hope gaining representation on platform committees will help them shape the party’s stated values toward their own agendas. In 2016, Macias ran as a Republican for a seat in California State Senate representing District 15. He was defeated and received just three percent of the vote. He says he currently pursuing a position in the California State Assembly, in addition to the position on the California Republican Party Platform Committee. On Facebook, Macias has used his profile to provide a running commentary on white nationalist movement goings-on. Macias called Identity Evropa leader Patrick Casey a “cuck for shutting down IE,” referring to Casey’s decision to fold Identity Evropa and rebrand his efforts under the name “American Identity Movement.” He has said that white nationalist Nathan Damigo, who founded Identity Evropa and is facing lawsuits for violence that occurred during Unite the Right, was his friend. Of violence at Unite the Right, Macias has alternated between mocking it and defending it. On February 18, Macias shared a photo making light of the car attack that killed Heather Heyer and injured 28 others who were protesting Unite the Right on August 11, 2017. 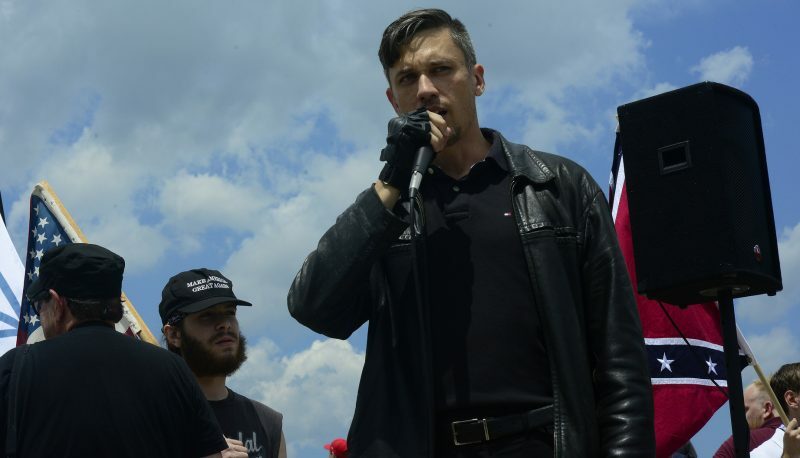 On January 30 of this year, Macias said the prosecution of the members of the neo-Nazi group Rise Above Movement for inciting a riot at Unite the Right was “baseless political prosecution.” On Facebook, he lists himself as an employee of the American Legal Defense Fund, a group affiliated with Invictus that is seeking financial support for the indicted group members. The phone number that Invictus currently provides for those requesting his legal services has a Los Angeles County area code.